In September of 1777, with Philadelphia under British control, George Washington selected a site for his winter encampment. It was a highly defensible area of rolling hills, about twenty miles from Philadelphia on the south shore of the Schuylkill River, known as Valley Forge. It was a position that would enable Washington to keep an eye on his adversary as well as protect the eastern Pennsylvania countryside. The exhausted, ill-equipped twelve thousand-man army settled in on December 19th. Archeological studies have shown that a line of entrenchments guarded the encampment and the wooded Mt. Joy provided ample timber to construct the roughly one-thousand 14’ x 16’ x 6 1/2’ huts that were needed to provide shelter for the men. It was a bitter winter and supplies were very scarce. Men wrapped their feet in rags and shared blankets in an effort to ward off the extreme cold. They boiled every part of their meager beef rations, including skulls and hoofs, to make a life sustaining stew. Sanitation became a serious problem and as immune systems weakened, Typhoid, smallpox and dysentery set in. Approximately two thousand men died of disease. Washington realized that if his collection of various state militias were to have a chance on the battlefield in the next year, the men would have to function as one cohesive unit. Until this time, each state militia had used different training manuals and varying degrees of discipline; so each functioned quite independently. While Thomas Jefferson was in Paris trying to gain the support of the French, he met and recruited an exceptional Prussian military expert named Baron Frederick von Steuben. Upon his arrival at Valley Forge, von Steuben was given the responsibility of training the ragtag troops. About the time that this training began in the spring of 1778, an enormous amount of shad began spawning up the river and the resourceful men finally had a source of complete nourishment. In a few short months, von Steuben taught the colonials to rapidly maneuver, in unison, as one efficient unit. Morale and pride improved and the American army became a powerful, efficient fighting force that earned the respect of their enemies and the rest of the world as they emerged from their horrible ordeal. 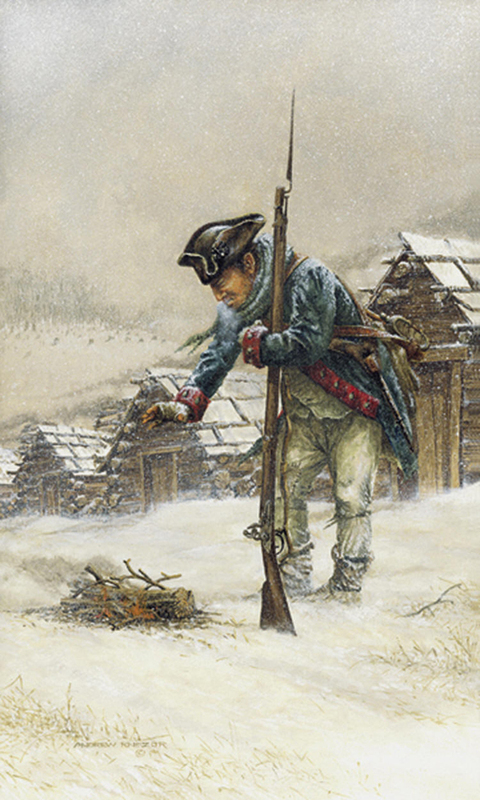 This painting, of a member of the 8th Pennsylvania regiment, illustrates the horrendous conditions faced by the men at Valley Forge. The men endured a three-hundred mile forced winter march across Pennsylvania to join Washington’s forces in January of 1777. They engaged in numerous conflicts prior to going to Valley Forge the following December. Their clothing and accoutrements, which were poor to begin with, were now in tatters. It is not difficult to imagine this sentries many feelings and questions about his personal sacrifices, and the value of freedom, as the wind and snow whips around him.